If only there was a published guide to some aspect of that area on newsstands right now! In addition to housemade sausages and desserts, they serve up a nice assortment of hot dishes at lunch. I subscribe to Time Out. I read the article. This is how pathetically bad I am at connecting addresses to neighborhoods, especially on the South Side. I really need to work on that. I'm starting to think lunch at Duke's on Sunday might be the best plan, giving us afternoon daylight to explore a few of the other places. Racine bakery looks great - they're open til 2pm on Sunday. I plan to throw a cooler in the car and would love to come home with some mushroom koldunai. Lynn, make sure you check out their "day old" rack. They will often have surplus items and yesterday's stuff available for dirt cheap. Great for freezer stockup. LynnB wrote: :oops: I subscribe to Time Out. I read the article. This is how pathetically bad I am at connecting addresses to neighborhoods, especially on the South Side. I really need to work on that. They also have the very best mushroom soup! A little bit of barley. Everything I have had there has been very good (sometimes the baked items might be a little dry). They also have several filled meat items (either dough or potato) that seem to have the exact same meat filling. Maybe we will join you for lunch? I'll PM you with our cell phone #. Looked on their website and did not see this location listed. Menu looks very similar to the southside location. I'm pretty sure that North Harlem address is what we call a "typo," since it's the exact same number as the South Harlem address. Mike G wrote: I'm pretty sure that North Harlem address is what we call a "typo," since it's the exact same number as the South Harlem address. My bad. Verified on their website. Google had the southside location listed as 6320 S. Maybe the address of the deli? Thanks for saving me a trip! Stopped by today and had a good lunch! a breaded pork tenderloin and a plate of potato pancakes rounded out the meal. I finally, after all of these years, tried the potatoe sausage and I was surprised to find the filling, just potato! Maybe a bit of bacon for flavor. Pretty good and I would order it again. My bride enjoyed her breaded pork tenderloin with mushroom gravy very much was her favorite thing she has ordered there yet. Had a good time! The place was doing a good business for lunch on Sunday. We headed there on Sunday evening after dropping off a friend at Midway. My cold beet "borscht" (they don't call it borscht, but I do) was creamy and refreshing. The kugelis that accompanied my pork roll stuffed with wild mushrooms was bacony and fantastic. The pork roll mushroom main dish itself, as Panther said, was a little dry. But tasty. Had a Svyturys Extra to drink with it all, which I liked quite a bit. Just as there is a Czech Paradox, there is a Lithuanian Paradox. This food is not the first cuisine you'd associate with "svelte." Yet every waitress in Duke's is slender and beautiful. Ours had a face that made my heart go all a-flutter. stopped at grand duke's today for lunch with the 3 of the 4 antoinette's in my life. 2 grand mom antoinette's shared the samething. it is called grand duke's now . stopped back at grand duke's this afternoon with a big group (11) . service's was outstanding for a big group. food was on spot . tried the skirt steak & veg. 's , crepes with banana's & pork tenderloin . the sides are great . 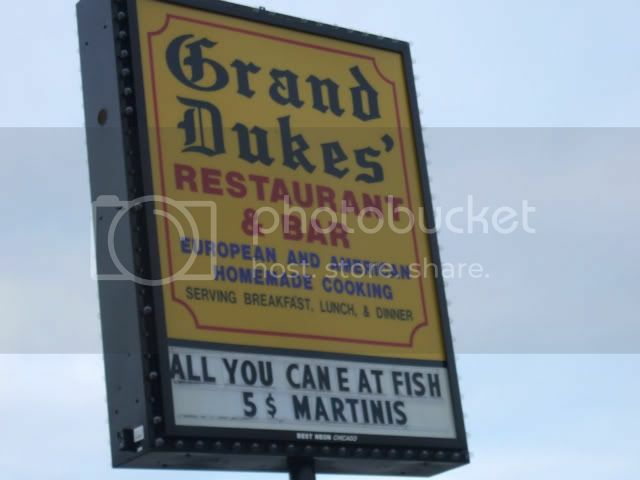 Id been wanting to visit Grand Dukes since I read Panthers post upthread. Menu looked interesting, with hearty rib sticking dishes. Had the opportunity since I was in the neighborhood yesterday, and stopped in for a beer with a buddy. 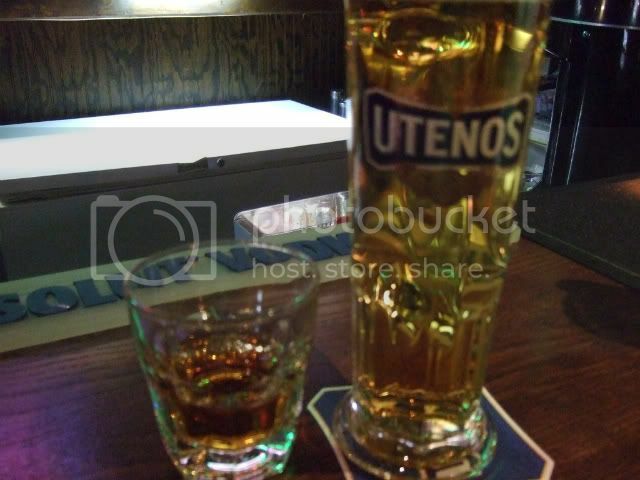 Interesting decor, friendly and attractive eastern European bartender and servers. I was going to go for one of the lunch specials, and the dumpling offerings sounded fantastic. We went with some beer on tap, Jim Beam neat(healthy pours), and The Grand Dukes Snack. 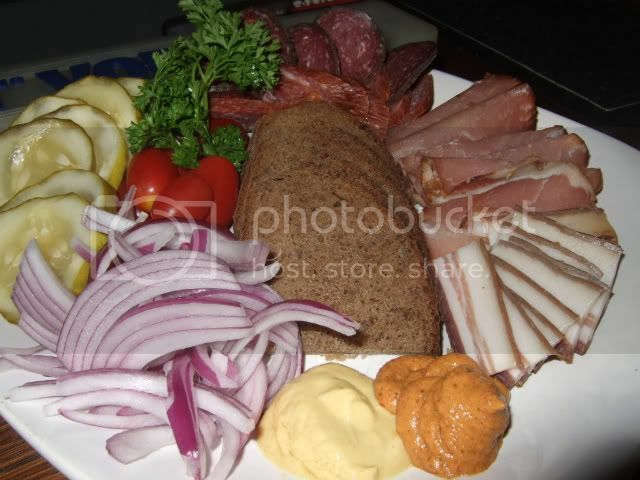 A platter that contained cold smoked ham, cold smoked sausage, cold smoked bacon, bread, onion, tomato, and mustards. A nice taste of their house meats. Ham was my favorite followed by the sausage. Bacon wasnt my thing. Prices were good, and based on this quick visit I am going to bring the family back asap. I'd been eating at The Duke at least once a week for the past 4 years. I've sampled many menu items, fried zeppelins, boiled zeppelins, potato sausage, kugelis, pork cutlets, country style duck, pike in a cream sauce, fried fish, steaks, lots of sandwiches, cobb salads, soup almost every time, white salad, red salad, dumplings, even cheeseburgers on a few wayward occasions. If my wallet was tight, it's be soup & salad for $5. After the first few meals there, we noticed they served breakfast, and went in not knowing what to expect. 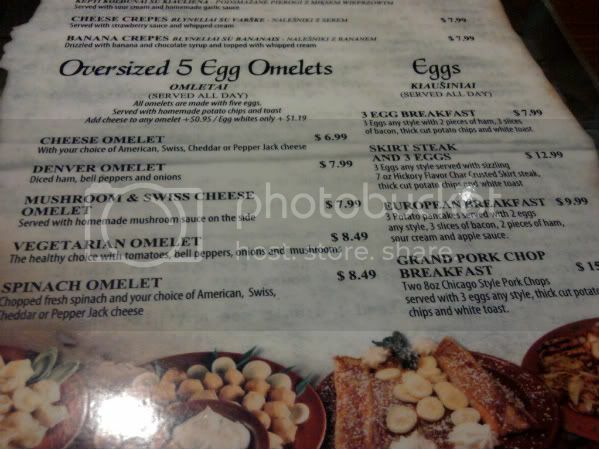 It was an American-style breakfast with the value price tag one expects to find on the South Side, 2 eggs, hashbrowns so fresh I think they were grated to order, choice of meat and pancakes or toast for $5.50-$8 depending on choice of meat. Perfectly crisped pork chops had a moist interior. The bacon, breakfast sausage and Polish sausage were homemade and all outstanding. The pancakes to die for. Normally I'd order toast to sop up my yolk, but after one bite of pancake I had to make do with hashbrowns to soak up any errant yolk. The breakfasting brought us to the Duke twice a week for a little over a year. After some time the Polish sausage was no longer homemade. It was about a month after the NRA Show that year, and I suspected that had something to do with the bought in Polish. The bacon and Lithuanian sausage did not succumb, however, so I was only out one option. Imagine my dismay when breakfast was discontinued! All was not lost. We still had Chuck's for breakfast and the Duke was still there for evening meals. Maybe not as crispy as chips but flavored with the last of our melrose peppers, roasted and plucked out of the garden. Sorry no close-up on the potatoes. So I wish the new Duke's breakfast choices came with the freshly grated hashbrowns of yore. Anyway, enough of this diatribe on breakfast, my intention with this post was to announce some menu changes that've happened within the month at the Duke. Along with the addition of their new breakfast, they've added to the regular menu a special that ran all Fall, Hungarian Goulash for $12.99 it's chunks of beef slow-cooked in a paprika sauce served with potato pancakes and pickles. I've eaten it twice and it's very good. Some items were taken off the menu, much to my boyfriend's son's horror, they no longer have potato dumplings! Other dumpling options are still available, but the potato is no more. Also, no broth with kybyn. I went there sick hoping to be fortified by their rich stock, but the menu changes did not allow it. I asked the server and he would not oblige. Kybyn was an option that came with the broth, it was a meat pie in flaky pastry dough, like a Lithuanian empanada. I didn't specifically check for other choices that have disappeared, but be forewarned, the next time you go to the Duke, they might not have what you came there for. "Did you know that all food in NC is served on a biscuit? I ordered a biscuit - it came inside another biscuit. 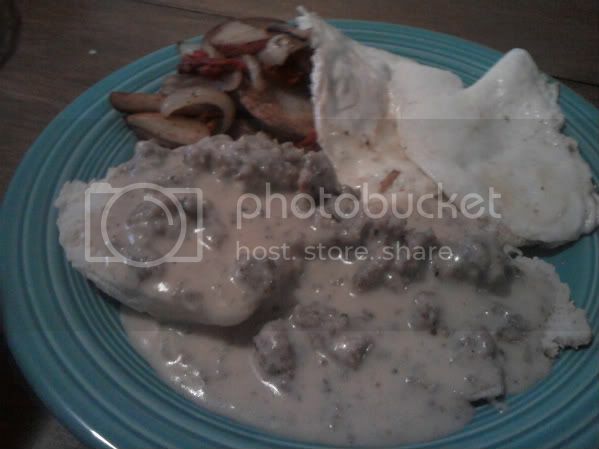 It was like turducken, but all biscuit." Jim, do you know what kind of fish is offered for the AYCE deal? Cogito wrote: Jim, do you know what kind of fish is offered for the AYCE deal? Well, I'm not Jim but the fish is cod and it's cooked to order. Duke's is celebrating its fifth birthday from 24-30 January with zeppelins, pork cutlets, Lithuanian sausage, pork dumplings, kugelis, cocktails, mojitos and martinis priced at $5. Anyone been to Grand Dukes in Summit lately? Going for dinner in mid August. Sweet Willie wrote: Anyone been to Grand Dukes in Summit lately? Going for dinner in mid August. Still good. Firing on all cylinders and doing a good business. The fried bread hill w/cheese was the big downer for our group of 8 last night, bread was so overfried that it was very hard, greasy & tasteless. I can imagine that if the bread is fried just so it is crispy on the very edges but chewy, this would be a terrific dish as the cheese/garlic sauce was quite good. But as mentioned, big disappointment last night. Great service, which isn't always easy to find at some Eastern European places I've been to. The other starter was the veal dumplings w/sour cream bacon sauce. Quite tasty and a deal as there were probably 20 in an order. While the beef tongue in cream sauce looked quite good, I opted for the Lithuanian Combo Plate: slice of Kugelis, zepplin, potato sausage, Lithuanian sausage, sauerkraut. Dinner also included a cup of soup, I chose the warm beet soup which was terrific. Highlight for me was the potato sausage and Kugelis. Zepplin was far too much dumpling that had very little flavor, ground meat stuffing was good. Lithuanian sausage was bland. Nice to have Lithuanian beer on tap. I'll for sure be back, just will stay clear of the bread hill. I'd say give the hill another try. Every time I've had it the breadsticks were cooked perfectly. Octarine wrote: I'd say give the hill another try. Every time I've had it the breadsticks were cooked perfectly. Having grown up with Welsh rarebit being one of my favorite dishes, I suppose I'll have to give it another go when Mrs Willie & I visit later this fall. Had a nice meal with friends celebrating Cepelinai Day. Moderately busy in the middle of the afternoon. New menus and table service. The Bread Hill was as good as always and tried something new (at least to us) Meat Pockets. The latter being a pastry dough filled with their universal meat filling with a side of chicken broth (?). The use of cast iron for the serving dishes added a nice touch complimenting the rustic, heavy dark wood interior. Not everybody ordered the star of the day, My Bride the Pork Tenderloin, very tender, light breading and a mushroom gravy. One of her favorites! Of course the meal wouldn’t be complete without ordering their delicious Wild Mushroom and Barley Soup and a side order of Kugelis. ... which is right across the street from the new location. I would imagine the Cafe will close once the new location opens??? You have until September 16th to visit the Harlem location. Rumor has it that the Harlem restaurant will become a BBQ restaurant. Panther in the Den wrote: Rumor has it that the Harlem restaurant will become a BBQ restaurant. Actually, now that I check the Facebook page again, it's Thirsty Pig BBQ that is coming to the location. Yikes! Talk about jumping the shark. Yeah, I'm a bit saddened, because this place was in my extended neighborhood and is where we had our wedding rehearsal dinner and where my wife and I go every year to celebrate our anniversary (except last year, when we both forgot.) I'm sure we'll make it out to the Downers Grove location, but it was a nice little gem in the area.